Today we reviewed the first Maximum Zombies set, but the doctor and the biker weren't the only ones available: there was a third, super-secret zombie given out at the Diamond Select Toys booth, starting at 10am every day of the show. The third zombie is a plain civilian. He's wearing a short-sleeved blue shirt with a pocket on the breast, and jeans with a painted fly and belt loops. Of course, he's also covered in blood: splotches on his pants, a little bit on his sleeves and stomach, and then a massive pool of it on his chest right below his chin. He either threw up his lunch, or he bit into a gusher! If you look through the dark red paint apps, you'll notice that beneath the button-up shirt, he's wearing a T-shirt, and there's a patch of skin right below his neck - an impressive level of detail for something that subsequently got covered by paint. Unlike the doctor and the biker, he doesn't have any visible wounds, so we're left to wonder how he got turned. One thing you'll notice about the Maximum Zombies is that their fleshtone is unusual. It's not the soft pink used for caucasian Minimates, but rather a pasty yellow that helps set them apart from your run-of-the-mill blood-soaked maniacs. The civilian has his teeth bared, flecks of blood on his cheeks, and appears to be bleeding from the eyes. He's got a beard and mustache, and a hair piece that flips up in the front. He's a hipster zombie! We always say we want civilians to go along with our toylines, and right off the bat, Maximum Zombies delivers. Sort of. He's still a zombie, of course, but he's just "dude on the street" zombie, nothing outlandish. He'll be great cannon fodder as the line expands. Ever wanted to be a zombie? 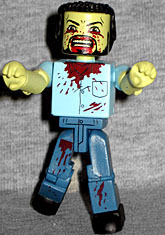 This entry was posted in addendums, Art Asylum, MMMR and tagged Minimates, zombies. Bookmark the permalink. Considering how much time you guys spend with Minimates, I think you may have missed a hidden joke... The eyebrows and cheekbones really sell it to me. GOT BLOODSTAINS ON YOUR FAVORITE SHIRT!?!?! OXI-CLEAN WILL GET THEM OUT!!!!! We asked, and sadly no, it's not based on Billy Mays. It is based on a real person, but it's "not a public figure" (so probably somebody's brother or something), and thus not anyone we would know.